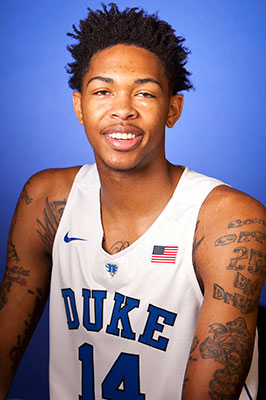 Strengths: Brandon Ingram is a long, lanky, athletic wing with an extremely versatile game, especially on the offensive end. Ingram’s length and wingspan allow him to shoot over most other wings who try to guard him, and he is an excellent shooter. Ingram has great range on his jumper and with his height, is difficult to block. Ingram also possesses great athleticism and is more than capable of attacking the basket. He is a high IQ player and an excellent passer as well. He does a great job of making the extra pass or finding an open man on his drives. Defensively he has great potential thanks to his size and athleticism. He is able to challenge shots on the perimeter and down low because of his great length. It also helps him to get in the passing lanes at times. Weaknesses: The obvious improvement that Ingram needs to make is physically. At less than 200 pounds, he can be pushed and knocked around. He will need to add some muscle on his frame to be able to withstand the more physical style of play he will be introduced to. While his dribbling skills are solid, they could still be improved upon and that will only make him even more dangerous. With his shooting and passing already exceptional, getting his ballhandling to that level will make him nearly impossible to stop on offense. Ingram also needs to improve his overall level of effort on the court. He can tend to coast at times and will need to maintain a consistent energy level to realize his vast potential.